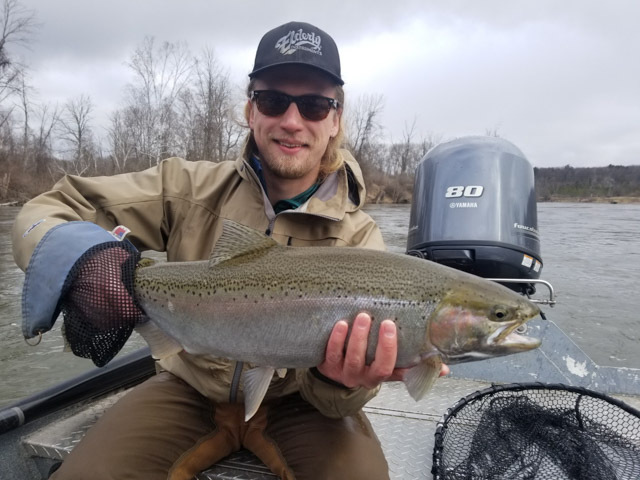 The Lower Manistee River Fishing Report is spring steelhead are in full swing! Water levels have once again made another jump after a week of rain, snow, rain, and more snow. You have to love Northern Michigan in the spring. Flows jumped up to 3000 CFS again and currently sitting around 2850 CFS. Clarity remains fair, still mostly green, but there was more of a brownish green color as of yesterday. Some fresh Chrome showed up this week and we should see another shot of spring fish moving into the river this week with a bump in flows and some warmer weather. 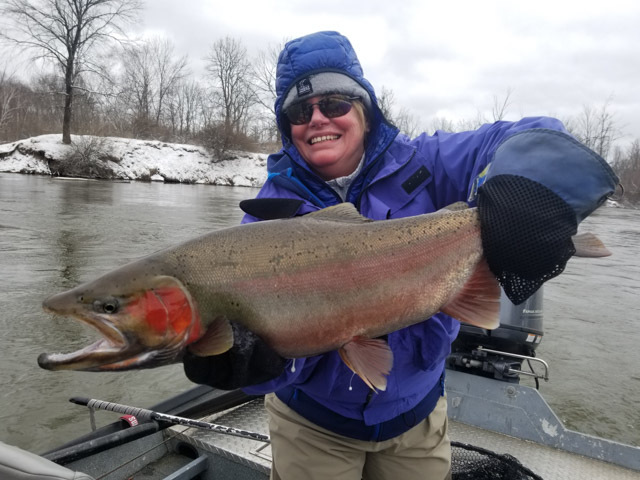 We still have prime spring steelhead dates available through early May – call Cherie at 231-228-7135 to lock in your trip. River conditions still look great, even after a big bump over the middle part of the week. Flows currently are reading around 2850 CFS which is a slightly higher flow for this time of year. The water temperatures have climbed steadily over the past week too and have been hovering around 42F degrees heading into the weekend. We received some fresh snow and heavy rains this week causing the river to rise and color up. New spring steelhead continue to show up and our holdover fish are moving into traditional spring spawning water. As the water temps continue to climb we have been seeing another wave of new chrome entering the river and more spawning activity. Currently, we are finding most fish in typical spawning water and the deeper pockets and pools near the gravel. Don’t rule out the traveling lanes since fish will continue to move throughout the day and with the higher flows and 42 degree water the run should peak this week. The best flies lately have been eggs, however, with increasing water temps, the nymph bite has gained steam. Most fish that we have hooked on nymphs were on large Black Stones, Green Caddis, and Hex/Parr patterns. During the sunny afternoons on the warmer days we have been seeing stones hatching and they are becoming an important food source. Egg color has been all over the place depending upon conditions. Brighter eggs like orange and chartreuse during the low light periods and cloudy days to more pale oranges and yellows in the sun. Size has been important too and smaller seemed better on the brighter sunny days, but larger sizes have been good in the higher water, cloudy days, and during the early morning times. We will continue to update the Manistee River Fishing Report on a weekly basis. If your looking to book a Spring Steelhead trip now is the time to call, as Prime Dates are filling up. We have a good number of fish in the river now. The steelhead run on the Manistee River is at or near peak this week and should stretch into early May this year. Of course, all of this can change quickly with some warmer weather. Make sure to check out the Pere Marquette Fishing Report as well. We continue to add recent pictures and useful links to our Facebook and Twitter pages so follow us on these social media platforms if you haven’t already. Open Boats are Available for Full day trips for Spring Steelhead. 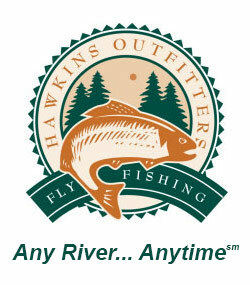 Give us a call or contact us to book your fly fishing trip now. Not too early to get a Prime Trout Date as well. Early Season streamer trips will be starting soon.